Twenty years ago, on 12 August 1995, Ali and I arrived at a small centre for disabled children at Kanigiri, Andhra Pradesh, south India. Ali had heard about the centre two or three years earlier and had been sponsoring two boys there. They had written to her and asked her to visit....so we did. I went to India with Colin Harte, my full time assistant, to visit a new project to help disabled children, little knowing that it would change my life for ever. Many of the children are so disabled they can barely manage to crawl in the dust. They are unwanted and unloved by their families, but it is true to say that they saved my life. The first time I visited the children they called me "Mummy." They hugged and loved me, and as I was playing with them, I suddenly loved them all, overwhelmingly and fiercely, as if they really were my own. When we left I said to Colin "I think I want to live." It was the first time I had thought that for over 10 years. 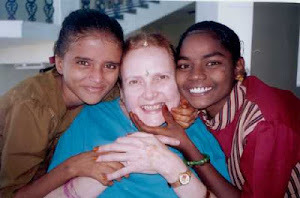 Returning to England, Ali learned the children's language, Telugu, so that she could write to them and speak with them. 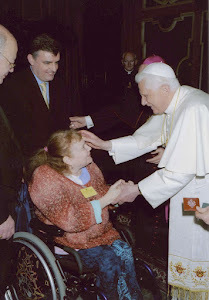 She worked tirelessly to raise funds and to develop medical support for these and many other children. All these things were done in addition to her full-time employment. The video, above, (or here) is a thankful and joyful reminder of that first visit to Kanigiri, and of the children who always remained close to Ali's motherly heart. The music in the video is a song from a Telugu movie, Nuvve Kavali. We took the children to see it at the cinema in January 2001. The music and the movie was one of their favourites, as well as Ali's.